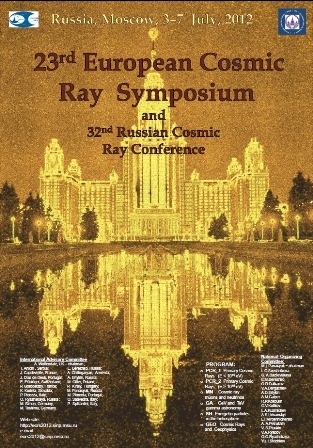 The 23rd European Cosmic Ray Symposium ECRS-2012 will be held at the Lomonosov Moscow State University in Moscow from July 3 through July 7, 2012. 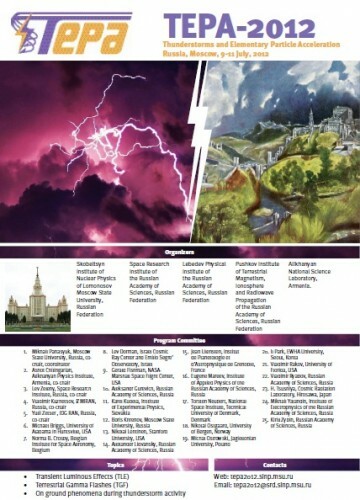 ECRS-2012 is the 23rd in a series of European Cosmic Ray Symposia. Ashot Chilingarian (Armenia). Thunderstorm Ground Enhancements at Aragats (TGEs) ― new high-energy phenomenonoriginated in the terrestrial atmosphere. A. Reymers. Geophysical research network at Aragats Space Environmental Center. А. Chilingarian, K. Arakelyan , S.Chilingaryan, A. Reymers.